Independent analysts say Pakistan has started work on a new reactor that could signal a major expansion of the country's nuclear weapons capabilities, The Washington Post reported. The paper cited in Monday's editions an analysis by the Institute for Science and International Security that said satellite photos of Pakistan's Khushab nuclear site show construction of what appears to be a reactor capable of producing enough plutonium for 40 to 50 nuclear weapons a year. It said an assessment by the Washington-based nuclear experts concluded that would represent a 20-fold increase from Pakistan's existing capabilities. "South Asia may be heading for a nuclear arms race that could lead to arsenals growing into the hundreds of nuclear weapons, or at minimum, vastly expanded stockpiles of military fissile material," the institute's David Albright and Paul Brannan concluded in the report, a copy of which the Post said it was provided. In Islamabad Monday, Foreign Ministry spokeswoman Tasnim Aslam said her country opposes a nuclear and conventional weapons arms race in South Asia. But she also declined to reject the report. "This ought to be no revelation to anyone because Pakistan is a nuclear weapon state." Aslam said. "(But) I have no specific comments on Pakistan's facilities." 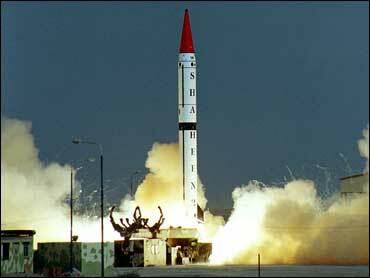 Aslam defended Pakistan, saying it was not the first country to introduce nuclear weapons into South Asia. The comment apparently referred to archrival India, with whom Pakistan has fought three wars with since 1947. "We were not the first to test nuclear weapons in this region and that remains our position," Aslam said during a press conference. "We do not want an arms race in this region." The Post said the assessment's key judgments were endorsed by two other independent nuclear experts who reviewed commercially available satellite images, provided by the company DigitalGlobe, and supporting data. The Post also quoted a senior Pakistani official, speaking on condition of anonymity, as acknowledging that a nuclear expansion was under way. "Pakistan's nuclear program has matured," the official told the Post. "We're now consolidating the program with further expansions." The expanded program includes "some civilian nuclear power and some military components," the official was quoted as saying. Pakistan and neighboring India, which also has nuclear weapons, have never signed the nuclear Non-Proliferation Treaty. News of the developments in Pakistan comes as Congress gets ready to take up a nuclear cooperation agreement between the Bush administration and India in which India would get access to sensitive U.S. nuclear technology in exchange for agreeing to more stringent safeguards over its civilian nuclear reactors.